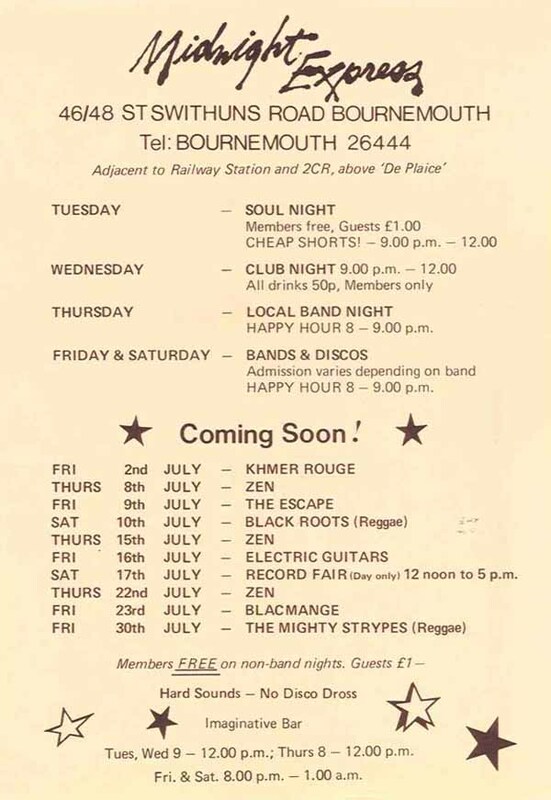 Midnight Express (presumably named after the-then recent film of the same name) was a Bournemouth gig venue and nightclub that existed in the early 1980's. It was only actually around for less than a couple of years, but is still fondly remembered by those that frequented the place back then as a bastion of "alternative" entertainment on the Bournemouth club scene. Located in a particularly seedy part of town near the railway station (that itself was deliberately built well-outside the town centre so as not to be considered an embarrassment/eyesore by posh Victorian residents), it was the brainchild of Mick Tarrant who ran the ace Armadillo Records (located between Westbourne and the town centre, on the corner of a small and shabby parade of shops) and Louis O'Mara, an Irishman who owned the Comix bookshop virtually next-door (which included the legendary basement rehearsal rooms, that many local musicians of the era came to know as a home-away-from-home), along with still-mysterious third partner (who I would speculate was probably the major shareholder/moneyman in the enterprise). 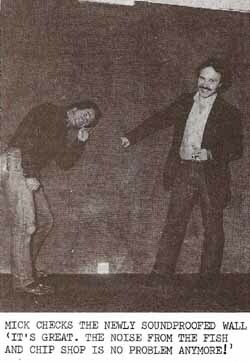 Mick and Louis seemed rather an odd couple, Mick coming over as a cheerful avuncular type whilst Louis was a polar opposite - it would not be uncharitable to describe him as the Basil Fawlty of second-hand book stores (was the series "Black Books" inspired by him?). 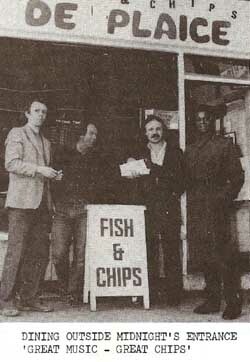 However, these contrasting characteristics served them well in their new venture, in which Mick acted as in-house DJ and band-announcer, whilst Louis policed the door along with a couple of bouncers (one of whom I recall being a black guy, which was quite unusual at the time - foreign language students apart, Bournemouth was hardly a multi-cultural place in those days). 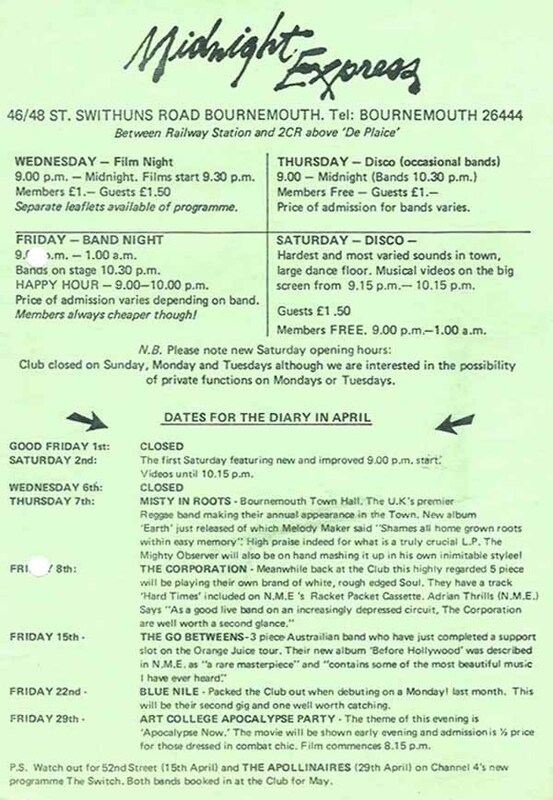 Apart from a love of music (well, at least in Mick's case anyway), the consortium presumably instigated their new venture because they had spotted a gap in the market: by the early 80's, although the town had a thriving local music scene, there was not one single small venue as such to accommodate it. The only dedicated live venues were the likes of the Winter Gardens which were not only too large for local acts, but also those who were newly-signed to record labels and beginning to make a reputation in the music biz as well. The owners set out not just to attract such bands and their followers, but also those who felt uncomfortable with the "Saturday Night Fever/dancing around handbags" club scene that was still flourishing. The chosen venue was sited above a fish and chip shop (which came in handy if you had the munchies - I remember making a point of buying a bag of delicious mushroom fritters every time I left the club). You entered via a steep set of stairs, and once in the place you passed through a small and dingy bar to get to the performance area, which doubled as a dancefloor (if rather ill-lit one) when bands weren't playing. To say the place was spartan was an understatement, but apart from its lack-of-decor probably being dictated by lack-of-funds, I'm sure the proprietors would have seen the gloomy and dystopian surroundings (it would not have looked out-of-place as a set in "Escape From New York") as a reaction to the bourgeois and glitzy chrome-and-mirror joints that comprised most of the club scene at that time. I think what little furbishing done was through the efforts of friends and acquaintances - I seem to recall when top local act Biz Internationale performed on the formal opening night, some members of the band had been performing the final touches of painting and decorating in the club earlier that day! I remember there being much mouth-watering anticipation of the venue opening, and once in business, it immediately started making a reputation for itself, attracting those into the "alternative" scene (becoming affectionally known as "The Midnight", despite my own efforts to dub it "The Express"). 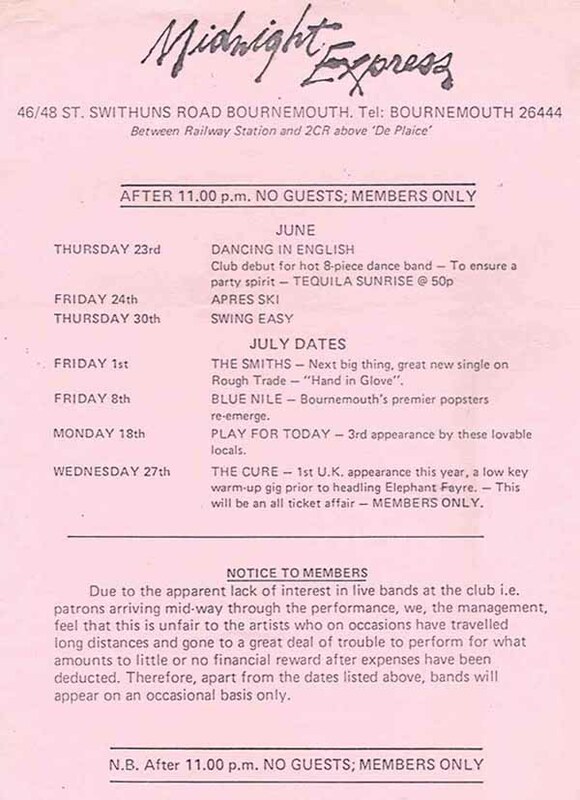 The music industry also soon realised the advantages of using the place to launch their latest up-and-coming signings, some of which would go on to at least dent the charts on several occasions (Tears For Fears, Blancemange), and in one case even become legends (The Smiths). Big-at-the-time band The Cure also used the Midnight as a warm-up venue for their tour, and other celebrities who passed through as patrons included Spandau Ballet and boxer Frank Bruno. However, in this welter of shameless name-dropping, it should not be forgotten that the management also encouraged the development and exposure of not just less-commercial entities (such as reggae and dub exponents) but many local acts as well (not just to fill "dead" nights either, but prestigious weekend slots too), some of whom would end up packing the place out, which greatly enhanced the community spirit and feel-good aspect of the club. 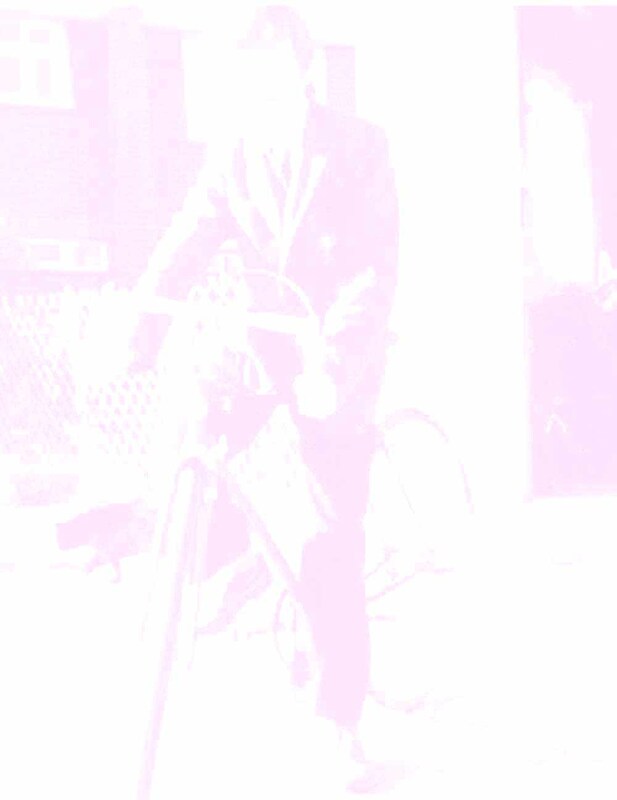 However, despite the above perks of the job (even the curmudgeonly Louis seemed to lighten up when at the club), one suspects that what started out as a dream had eventually become if not exactly a nightmare, then at least bloody hard work without sufficient reward. Although it had a reputation for a laid-back clientele, I once remember a fight breaking out involving a local heavy that even the bouncers were too scared to evict (shame Bruno wasn't there that night), and there was also an eventual downturn in enthusiasm for live acts (that the management had often worked hard to book and promote), which meant the club reluctantly decided to focus more on disco/club nights (see flyer below) - although not the normal sort of disco music you'd expect to hear. Mick's memorable motto was "Hard Sounds - No Disco Dross", and I recall a big favourite that typified that outlook being "Rock The Casbah" by The Clash, although even that paled into insignificance compared to what was virtually the club's anthem: Nina Simone's "My Baby Just Cares For Me". 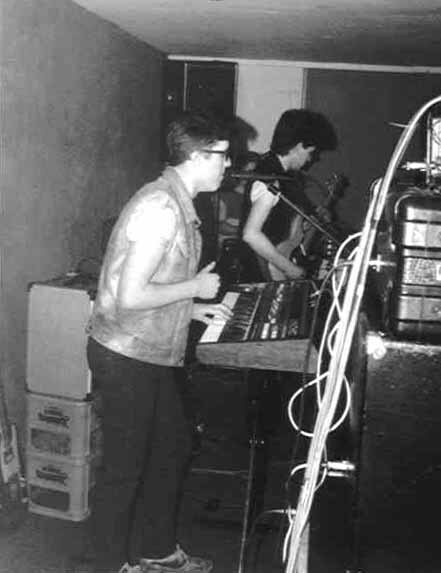 Although the direction of the club had began to change, it still appeared to be doing okay for itself, so the end actually came rather suddenly (in fact virtually overnight - they put on a New Year's Eve Party at the end of 1983, and announced to those present that they were actually pulling the plug that same evening). In more recent times (in an interview with Nick Churchill in the Bournemouth Echo) Mick Tarrant indicated that local Council demands were a factor in the decision to quit (recalling "the staircase needed widening - when Frank Bruno came up, his shoulders were touching the walls"), although in retrospect one could draw a conclusion that the club was becoming more trouble to to run than it was worth, especially if those concerned were in it for the kudos rather than the cash. 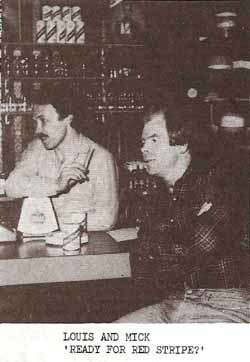 Not that it seemed to bother Mick and Louis too much - after its demise (the premises were then re-opened as a gay club) they launched a swanky bistro/bar ("Midnight Express Cafe") in the much more salubrious environs of Westbourne (that sadly bands couldn't play in), whilst Mick carried on DJing either on the road or as a guest in other venues. 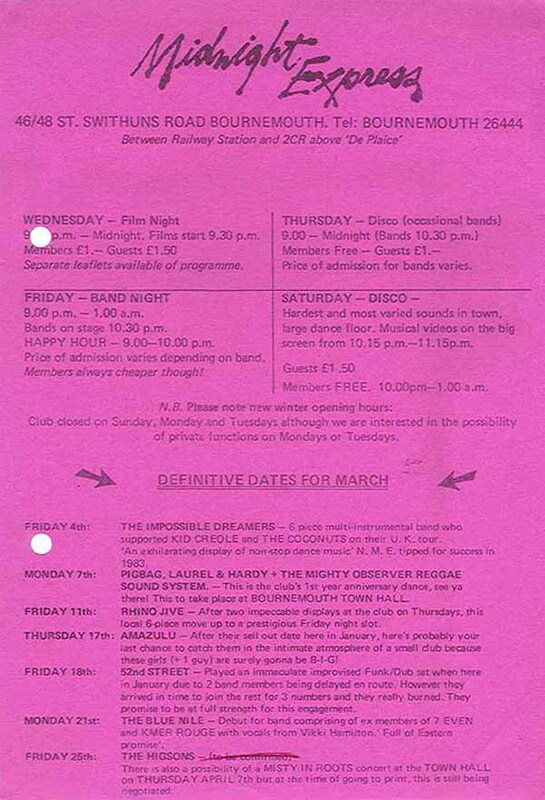 They also continued to promote live music events such as The Smiths at the Town Hall (for which I was actually offered a job as part of security, but declined as it was an unpaid gig!). However, for others (particularly those that followed and/or were involved in the local music scene) there was now a void that could not be easily filled. Okay, so Upstairs At Eric's opened around the same time as the Midnight closed and catered on a similar level, but it never acquired the reputation or standing of its predecessor - perhaps because local bands barely featured compared to signed/touring ones...? Anyway, for what it's worth, thanks to Mick and his colleagues for their efforts back then - although I had the pleasure (and honour) of performing at their club before enthusiastic audiences on several occasions, I'm sure I am not alone in being guilty of not giving more support whilst it was going (I probably only went there once a month if that, and even then usually only to catch friends and acquaintances playing in their own bands, rather than to see signed acts or attend other events they put on such as discos, film-evenings and theme nights). Had I known its tenure be so brief I'm sure I would have tried harder, but that's 20/20 vision for you. My band was top of the bill!